In the parts of McHenry County I have been, only one Republican candidate has been invisible. 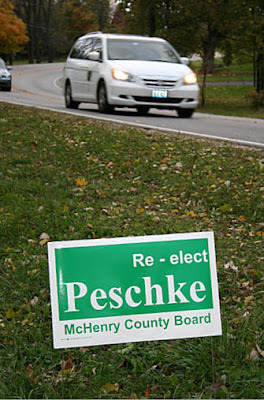 Long-time county board candidate Virginia Peschke, who can be counted upon to be an independent thinker and actually ran against Ken Koehler for McHenry County Board Chairman, was no where to be seen. 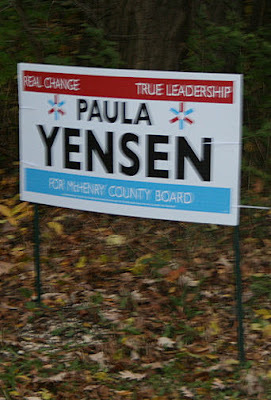 Sure, she ran first four years ago, but Democrat Paula Yensen has been working hard going door-to-door in her end of the district (the more populated Lake in the Hills and Huntley), while there were no reports of Peschke doing anything. I saw none of Peschke’s pamphlets earlier this month at GOP headquarters on literature distribution day. Meanwhile John Jung seemed to be working hard. And, well he should be given the history of extremely negative campaigning by Democrats in District 5. Frankly, I expected Jung to bear the brunt of similar negative attacks. I figured he was in the Democrats’ bull’s eye, since women are typically seen more favorably at the polls than guys. 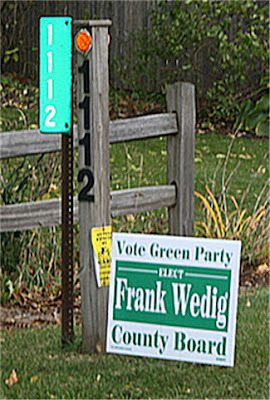 Muddying the waters is the candidacy of Woodstock’s Frank Wedig. He is running on the Green Party ticket. sign. After that I saw a few others. I don’t know if she is going to make a last week mailing to make up for not having given the precinct committeemen anything to pass out. 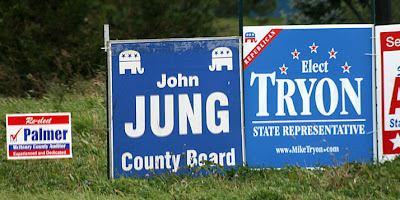 There were 4X4’s for Peschke’s running mate John Jung near Ridgefield.